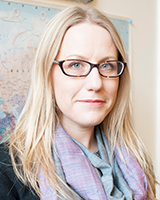 Lora is a Gender and Livelihoods Specialist at the Natural Resources Institute (NRI), University of Greenwich. She has worked on a range of research and consultancy projects related to gender and social difference, applied in a variety of development contexts, including value chain development, food security and nutrition, land and natural resource rights, and project monitoring and evaluation. Her research focus is on value-chain development of staple crops and its impact on rural livelihoods, using qualitative and quantitative methods. Lora will be leading the session on gender-based constraints and opportunities in the RTB value chain.